One day, Jerry Hess of St. Cloud gave his wife, Judy, a tiny jeweled angel for her charm bracelet. “This is for you because you are my guardian angel,” he told her. She was delighted, moved to the point of tears. Judy is not only Jerry’s guardian angel, she’s also his lifesaver. Thanks to her quick thinking and her use of an automated external defibrillator (AED), she saved Jerry from certain death after he suffered a sudden cardiac arrest. The Hesses live in rural south St. Cloud near Long Lake. Their neighborhood is one of three in the greater St. Cloud area (two in St. Cloud, one in Sartell) that now have AED Save stations. Judy remembers that day of crisis, Aug. 3, 2016, as vividly as if it were yesterday. She and Jerry were planning to drive to Winnipeg, Canada, the next day to visit good friends. It was 10:50 p.m. Judy was in the kitchen; Jerry was in his recliner just six feet from the kitchen door. Suddenly, Judy heard a frightening sound: a raspy gasping inhalation of air followed by a kind of loud whisper. She quickly looked into the living room and saw Jerry sprawled back on his recliner, eyes rolled back, body rigid “as a board,” as she recalled. She called 911. Then, immediately she started cardiopulmonary resuscitation on Jerry, giving him rhythmic chest compressions as she waited for help to arrive. As luck would have it, Judy had been a CPR instructor at St. Cloud Hospital and knew a lot about heart problems. 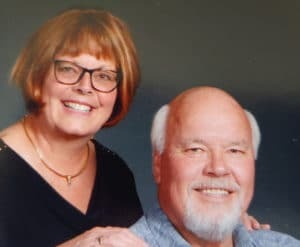 When the sheriff’s deputy arrived, Judy grabbed the defibrillator, opened it, placed it on Jerry’s chest and pushed the button, sending a life-restoring shock to his heart, getting it to beat again on its own. He was rushed to the hospital to recover. Next day, at the hospital, Jerry told Judy how sore his chest was – from her CPR, not from the defibrillator. And she told him she, too, was extremely sore from doing so many chest compressions for 10 minutes. But it was a “good sore” that made them smile. More than 30 years ago, Jerry’s father also suffered a heart problem that required the use of CPR. He did survive. It was at that time Judy decided to take a CPR course. Her expertise eventually led her to become a CPR instructor. Jerry, a retired insurance agent, now 64, has battled four kinds of cancer, most recently a form of melanoma. Judy is a dental assistant at St. Cloud Veterans Health Care System. They have two sons – Alex and Jordan. The Hesses live in the Sherwood West neighborhood near Long Lake, just 10 blocks from the new AED SAVE station. Fortunately, Jerry’s heart crisis didn’t put a stop to him being at son Alex’s wedding. He was there and even danced happily with Marie, his daughter-in-law. Jerry’s heart problem, however, did put an end to the couple’s trip to Winnipeg, the one they were planning the night the crisis happened. But, wait, there’s good news. Recently, they traveled to Maui, Hawaii, and there, all together happily, were the friends they’d planned to visit in Winnipeg. Judy Hess saved the life of her husband, Jerry by using an automated external defibrillator one night in 2016 at their home near Long Lake south of St. Cloud.